Enabling clients to adopt, mature, and optimize cloud technologies to meet mission goals. When challenged to do more with less, the cloud offers opportunities. We help our customers embrace the cloud by discovering strategic goals for cloud adoption and design a roadmap to achieve those goals. Whether it be innovation, increased agility, cost savings or mandates, we can help prioritize actions, build transition momentum, and optimize the cloud environment. 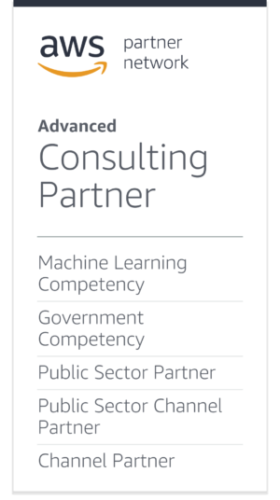 We are AWS Advanced Consulting Partner and AWS Public Sector Partner, having demonstrated quality cloud support since 2014. 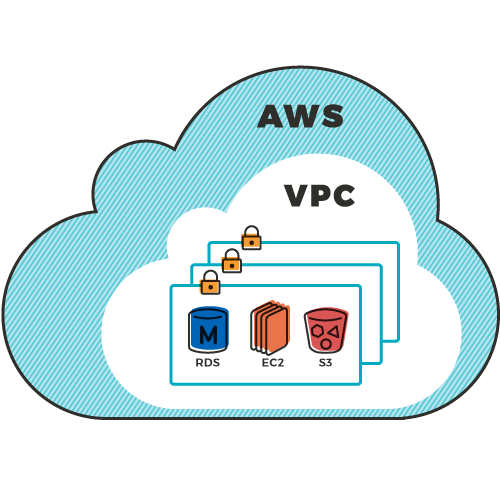 We employ more than 40 AWS certified architects, developers, and system administrators with hands on experience in all AWS Regions – Commercial, GovCloud, SC2S and C2S. Our certified cloud engineers follow our Cloud Transition Framework to accelerate and simplify cloud adoption.This Framework helps agencies identify systems, prioritize workloads, and create a migration strategy. We then take an iterative approach to tackle large-scale transitions one piece at a time, allowing for early wins and time for growth. By providing on-demand access to massive amounts of computing and storage, the cloud is a true enabler of big data analytics. We specialize in helping our customers leverage the power of the cloud to get true insights from Big Data. We are the engine behind some of the most critical and secure big data solutions in the federal government and have extensive experience building and optimizing data solutions for the cloud. Novetta Managed Analytic Services provides Big Data capabilities without the big price tag, allowing our customers to accelerate the transition to being truly data-driven.Through our Managed Analytic Services you get access to decades of data science and engineering expertise combined with world-class tools such as our Novetta Entity Analytics and Novetta Mission Analytics solutions – all managed and hosted in our secure AWS environment and overseen by our staff of trained and certified AWS engineers and developers. Improve your bottom line by transitioning capex to opex; allowing your team to focus on solutions, not hardware. 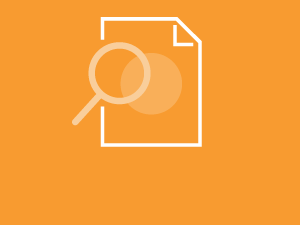 There is no faster way to explore a new technology than through the AWS Marketplace. We are committed not only to transitioning your workloads to the cloud, but also to making it easier to deploy our big data technologies. Novetta Mission Analytics (NMA) is a web application that allows analysts to collaboratively explore relationships between Entities and the source documents from which they have been derived. This NMA instance ships with a sample of data that has been generated from the Defense Contract Audit Agency Active Contactors List, the OFAC Specially Designated Nationals List, and the GSA Excluded Parties List. 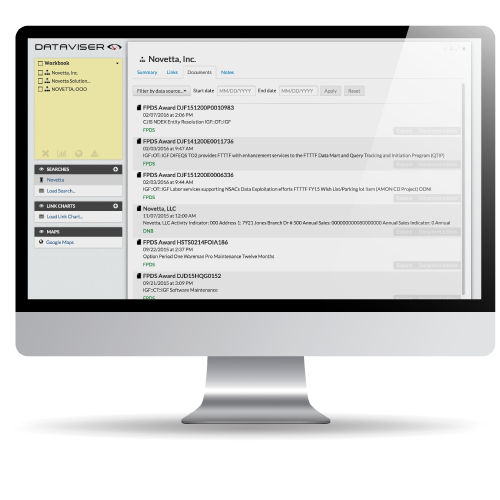 We developed DataViser as a big data visual analytics tool and data processing pipeline in 2012 using on-premise customer hardware. In 2014, we helped our customer migrate development efforts to AWS, subsequently moving the production environment to the cloud in 2015. Our customer retired all on-premise hardware, gained on-demand scalability to accommodate new datasets, and achieved shorter development cycles through parallel development and continuous integration. DataViser was granted Authority to Operate (ATO) by the Air Force less than one year after moving to the cloud. Another DoD customer needed a hybrid environment to expand their compute capacity and improve the availability of a big data analytic platform developed by Novetta and several key partners. Instead of simply lifting-and-shifting the existing platform into the cloud, Novetta re-architected the platform to leverage the speed, efficiency, and flexibility of S3. In addition to improving performance and massively simplifying scale-out, this solution continues to save the customer thousands of dollars per month compared to a lift-and-shift approach. The application received full Authority to Operate (ATO) on C2S in 2015 and remains in operation, providing critical capabilities to our customer. Instead of devoting budget to on-premise hardware recapitalization for a system with 100 users, a DoD customer was committed to the concept of cloud migration. In 2012, Novetta cloud experts developed a hybrid architecture to perform on-premise entity resolution while moving all user-facing functions, queries, and analysis to the Cloud. Within the customer’s budget, we established separate Dev, Test and Operations environments, added capabilities, and expanded the system to nearly 1000 users. Ready to transform your data? Speak with an expert who can answer any questions you might have. Whats Missing from Your Big Data Plans?